I'm always looking for an easy chicken dish. 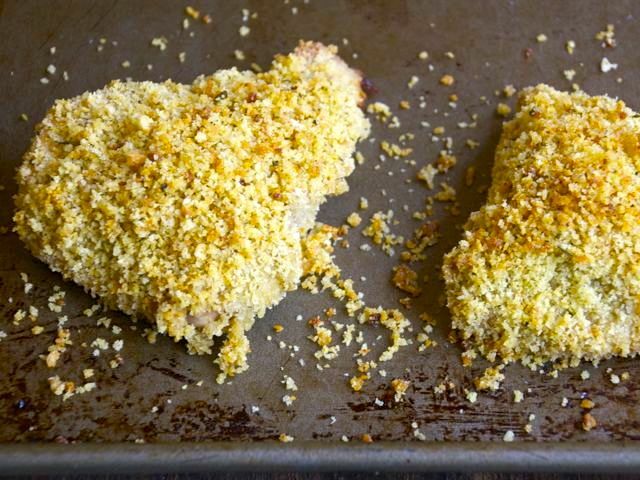 For this, whisk together Dijon mustard and white wine and use it as a coating for chicken the way you'd use beaten eggs, then dip it in flavorful panko crumbs. Moist and crispy chicken every time! To make in advance, prepare the chicken without baking it. Refrigerate then bake before dinner. Place the garlic, thyme, 2 teaspoons of salt, and 1 teaspoon pepper in a food processor fitted with the steel blade and process until the garlic is finely minced. Add the panko, lemon zest, olive oil, and butter, and pulse a few times to moisten the bread flakes. Pour the mixture into a large plate.